Anytime you need comprehensive, efficient and affordable help with transporting your personal items, furniture or office equipment across Hendon or some of the surrounding areas, you can count on us to deliver a service that is up to the highest quality standards of the removal business, and which – more importantly – will completely cover all your needs, personal requirements and preferences. Your project is going to be carried out quickly and without any hassle whatsoever – just in the way you wanted. Domestic removals Hendon residents have to get managed. Office relocations at a time that would be most suitable for you and will not disrupt your work process. Single item pickup and delivery. Packing and unpacking services with high quality materials. We provide storage space in a modern storage facility. Comprehensive rubbish removal and other complementary services that will further accommodate your moving experience. You should not hesitate for even a second about getting us to be your moving contractor of choice. Thousands of local residents and business owners have already done that and all of them have left positive feedback about the quality of the job we have done on their projects. Go through our list of services that pick up those that will best cover your needs. If necessary we are ready to tailor an individual plan for your move, so that it is guaranteed your utmost satisfaction is going to be achieved. Call us today on the phone numbers provided here, or contact us online via e-mail. In any case you are going to get a free no obligation quote for the complete price of your project. Our custom pricing system guarantees that the price you are going to be told will fit your current budget perfectly. Call us today for booking and a quote. 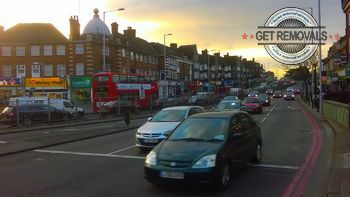 Hendon is one of the finest residential districts in the suburban borough of Barnet. Its location of approximately 7 miles from the City, as well as the good transport connections the area has to various important business centers throughout London make it the preferred place of residence for professionals who choose the comfort and peace of mind that the area offers. Hendon is a lively town with very long history. The local archaeological society found traces dating back to the Roman conquest here. Today the area is multi-cultural and important administrative and commercial district for Barnet. Some of the most famous current and past residents of Hendon include such distinguished names as pioneer aviator John Cyril Porte, actress Lacey Turner, the famous president of the Geological Society Henry Hicks, and the notable novelist Richard Llewellyn, author of How Green Was My Valley.